Birmingham is UK's largest cinema chain with more famous and renowned theatres like Odeon Cinemas, UGC, Showcase Cinemas and Warner Village. Cinema in Birmingham also includes the nearby Cineworld and UCI which have major complexes near Solihull. However the later do not have any cinemas in Birmingham. Odeon Cinemas is situated in the heart of the city on New Street. However the Odeon Cinema in Birmingham is not very big and is small and decent enough to accommodate the visitors. This is one of the oldest cinemas in Birmingham under the ownership of the Rank Group for 58 years. The Cinema was acquired by J Arthur Rank in 1942 from the Oscar Deutsch. Today it is under the consortium of investors with principal partners being WestLB, The Entertainment Group and Robert Tchenguiz of Rotch. Alternatively, Showcase Cinemas in Birmingham is situated in Erdington on the A38. It is one of the luxurious cinemas in Birmingham with state-of-art Dolby digital stereo and Dolby Exsound systems; custom-designed seats with convenient cup-holder armsets. The Show Case Cinema in Birmingham is owned and operated by National Amusements, a parent company of Viacom, which includes Paramount Communications, MTV Networks, Nickledeon, VH1, Blockbuster Video, and other major entertainment properties. Not to forget VUE cinemas or Warner Village which is a part of the Star City, offering major Entertainment to the people of Birmingham. It has a major entertainment complex in the Nechells area of Birmingham at M6 Junction 6. Birmingham Star City is a huge entertainment complex containing a multi-screen cinema, restaurants, stores, clubs and an enterntainment arcade. The star city has a free parking and the cinema has 12 screen all of which are accessible to disabled visitors. Birmingham Star City is the best location for cinema with theatres operated by VUE Cinemas or Warner Village. Star city is a fantastic day out for the whole family with wide range of shops and restaurants. 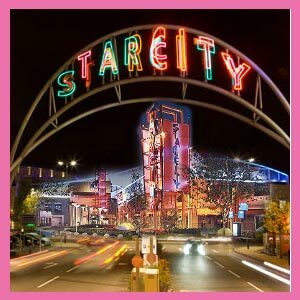 Birmingham Star City is the best entertainment zone in the West Midlands and is well known for its screening of Bollywood movies.